Description: Great location, 2.33 acres in quiet country setting overlooking small lake close to town and bluegrass pkwy. 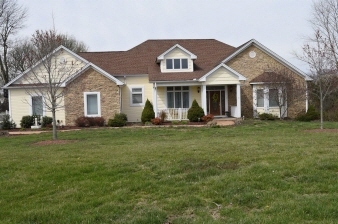 Custom built ranch open floor plan with finished walkout basement. Four bedrooms with 3 full baths all with granite counter tops. Master suite with whirlpool, separate shower and large walk-in closet. Great room with built-in surround sound, gas fireplace and built-in shelving. Kitchen with all appliances, pantry, large island and granite counter tops, formal dining, large laundry with second refrigerator, breakfast/sunroom, large family room with gas fireplace and kitchen area, craft/storage room. Specialty ceilings, crown molding, wainscotting in dining room and hallways, architectural features. Hardwood, tile and carpet flooring. Screened-in porch, large deck, covered front porch, covered patio, large patio area with stamped concrete. Two car garage with storage. Data believed correct but not guaranteed. Buyer to verify data prior to offer. Agents read agent remarks.